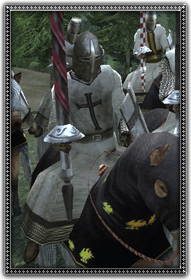 The Teutonic Knights are a German crusading order of knights committed to fighting infidels and pagans. Ruthless and unrelenting, they are the equal of other orders if not quite as disciplined. Wearing white surcoats with a black cross emblazoned on them, encased in heavy mail or plate armour, wielding lances and large maces, these knights love a good melee.